As owner's engineer, Voltaica Engineering operate as an extension of our Client organization, providing seasoned team with current, real-world technical experience, as well as the tools needed to develop, manage and achieve success in our Client’s projects. Utility scale power generation projects requires extensive engineering expertise and resources – often exceeding the owners and operator’s capabilities that can afford to carry in-house every project. Hence, our owner’s engineering services ensure smooth and safe project development not only providing design and cost analysis, and builder recommendations to the project owner, but also working with as part of the design and construction team to ensure the owner’s vision and approved design are effectively being implemented during construction. Whetever in a geothermal plant in Azerbaijan or a photovoltaic plant in South Africa, our work supervision service includes resident engineer or site representation to oversee all construction activity, including responsibility for interface management. Liaison with the relevant electricity network operator for grid energization and grid compliance testing. From experience acquired on-field, Voltaica Engineering purpose a high qualified commissioning engineering and management services embraching visual inspection, functional and prestactional testing. Wheter during the writing of a procedure manual and the execution of electromagnetic field of HV/MV substations, or during Montalto di Castro photovoltaic power plant modules infrared imaging Voltaica Engineering execute commissioning services complying on Client technical specification as wella as local and international norms (CEI-IEC, BS, IEEE, ecc.). Land electrical resistivity measurements with voltamperometric method. Earth resistance measurement and grounding system final test (CEI 11-1). Photovoltaic Plants final and (DM 19/02/2007) acceptance test. "hot spot" identification on PV modules with infrared thermography. Voltage test applied on MV cables (CEI 11-17). Electromagnetic field measurements to verify the statutory health limits compliance (CEI 211-6). Because all employees, regardless of the field or industry they work in, have a fundamental right to work in a healthy and safe environment, we provide the best solution-driven methodology to our clients and by following a team approach to ensure that specialist knowledge and experience is shared and applied to significantly minimise hazardous environmental conditions and, in turn, a client's risk. We conducting full risk assessments and evaluating the results to determine cost-effective measures to reduce any health hazard to an acceptable level as per legislative requirements. Review design and construction risk assessments. Assistance with establishing safe working practices and site rules. Coordinate compilation of site Health and Safety File. 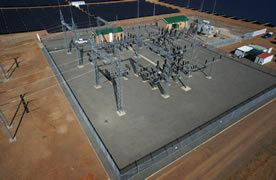 New 1 x 70/90 MVA 132/33 kV AIS Step-Up Substation, PV "Pulida", Single Busbar, n°2 132kV Feeder bays.